I have all of my birthday party supplies organized in large zip bags stored in 2 large totes in a closet. This works great to reuse items, mix n’ match crepe paper, balloons and other small items to save money. I have some favorites, as do the kids (I cannot tell you how many Thomas the Train or John Deere parties we’ve had). So when my 5 year old decided to go with a Star Wars theme for his 6th birthday I was elated. I hadn’t used my Star Wars party supplies in 10 years!! So I happily pulled out all of the saved items and began planning. The party we had 10 years ago was a much bigger party which included a fun menu (Jedi Juice, Leia Lemonade, Yoda Soda, Hoth Dogs, Jabba Jello, Light Saber Pretzel Sticks, Wookie Cookies, Naboo Nuggets), Star Wars games (Jedi Training, pool noodle light sabers), a Darth Vader Piñata and an official Jedi Certificate. This time around was a bit more low key. (We have a big party when they turn 5 with lots of friends etc. and then smaller birthday celebrations with 1 or 2 friends for all other parties as we feel they enjoy it a bit more with less kids and commotion.) Anyway……. As I was planning I checked with the birthday boy about what he wanted for the menu and what kind of cake he wanted. After much debate about the menu he took no time to decide he wanted a BB8 cake. So I assumed I could just do 2 round cakes (one small and one larger) to look like a BB8 laid down and we were good to go. The birthday boy had other ideas. He explained while that while that would be cool a 3D BB8 cake would be “Even more aaawwwesome!” He then quickly drew up some step by step instructions as to how I could make such a cake. I explained how I was nervous about it’s structure being sound but he assured me that I could handle it. After a few laughs I decided my 5 year old’s faith in my baking ability was enough to give it a go. I started out with my Betty Crocker Bake’n Cake Pan. It seemed to be about the same size as the BB8 plush he had. I was stuck on how to make BB8’s head though. While shopping at my favorite dollar store The Dollar Tree I found these small class bowls that were not only perfect for ingredients while baking they were exactly the size I needed to make BB8’s head! And a set of 2 for $1?? -heck yeah! class bowls. I placed the small glass bowls on a tray incase they overflowed. I followed the instructions from the bake’n fill set and all of the pieces turned out great. After baking I let them all cool. Once I was able to frost the crumb layer I put the insert cake piece into the rounded pice and then wrapped them in clear wrap before putting them in the fridge to set. The next day I was ready to build the cake and do the final later of frosting & decorating. I started by cutting off a small portion of the top of one of the rounded pans so when inverted it would sit without wanting to roll. I wanted to be sure BB8 wasn’t going to roll away ;). Then I inverted that base piece, frosted the flat portion to ‘glue’ the two base pieces together. After a nice layer of frosting I placed the second base on top making a nice round cake ball. (This is what I did 10 years ago when my first born asked for a Death Star cake). I then frosted to fill in the gaps around the ball. After trying to get the sides as smooth as I could I was ready to prep for the pipping. I used the lid of a tub of frosting to make 4 initial circles that would later be pipped. I decided it would be easier to do the pipping on the base before putting BB8’s head on so I got started right away. I used chocolate frosting with black Wilton coloring to make the black (starting with chocolate saves on the amount of coloring to make black). I used vanilla frosting with a touch of the black Wilton coloring for the gray and then vanilla with some orange Wilton coloring to make the orange color. I used the plush BB8 as a guide and got started. You can see a round wooden piece under the cake base. This is actually a Lazy Susan I got from Ikea which works great for spinning cakes as I decorate. As you can see I did all the pipping on the base including writing ‘Happy Birthday’ on the base BEFORE putting the head on. Crazy? Possibly, but it worked for me. SO then I took a couple plastic straws and cut them to place into the base for additional support. In the past I have used disposable chopsticks from a restaurant but I didn’t have any on hand so I decided to go rouge ;). I gently placed the head on BB8 which was a messy task but a simple hand-washing remedied the situation. Finally I added the details to the BB8’s head. I finished with 2 silver candles. I cut the base of one of those candles to make it look more authentic to BB8’s antennas. As you can see it’s a lot of cake but it was yummy and he was one happy birthday boy. It was no surprise to me when my tractor lovin’ little boy told me he wanted his 4th birthday to be a ‘John Deere Birthday’ theme. He and my 6 year old son both had already enjoyed John Deere birthday parties in the past so I already had some John Deere decorations in my stash of supplies. (Frankly, my older boys had done repeated Thomas the Train birthday parties year after year so this was pretty common place in the Menne house…AND saves $ to reuse items!) I got out all of the John Deere party supplies and started planning with the almost 4 year old. He quickly decided he wanted a “big John Deere combine cake!” I wasn’t sure what that was going to look like because the thought of making an actual combine seemed overwhelming. I asked him about a sheet cake with a combine ON it or making one with frosting but he wanted a “real big combine” so to the world wide web I went hunting through images of John Deere cakes until I stumbled on this amazing blog A Quiet Life in a Loud House which had not only the best, most amazing John Deere combine cake but also had awesome DIRECTIONS!!!! I was over the moon excited to give it a try. Her photos were great and explanation was perfect. I have to give her credit for the whole thing! 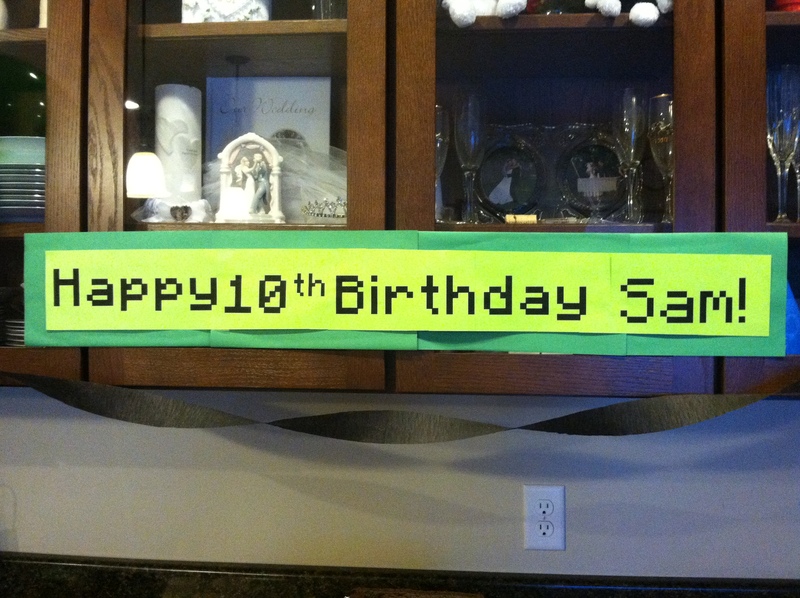 Decorations I used leftover John Deere napkins, party hats, balloons, crepe paper and signs from last year’s party. I got a green table cloth, green and yellow napkins, yellow cups, yellow plates and green plastic silverware all from the dollar store. I also found green and yellow ‘grass’ that is used for Easter baskets but it wasn’t the plastic kind so I grabbed a couple of those bags to fill glass cylinders to add to the color. I had white and yellow flowers left over from a baptism celebration the previous week which also were great to add to the tables. The last thing I did was raid the toy room to use the small John Deere toys the boys have as decorations. The Cake I found some scrap pieces of 2×4’s in the garage and covered them with aluminum foil. I had to make sure it would fit on my round cake base. Then I baked #2 9×13 cakes. I started creating the combine cake by cutting the appropriate pieces ensuring it would fit on the wood base. I used skewers I had left over from another party to help hold pieces together. I frosted it and then added a cut bendy straw for the auger just as Lora did in her blog. I also used ding-dongs and donettes for tires and big wheels. (The boys liked eating the left-overs). I was wondering what I was going to do for the combine head but was able to find one of the boy’s toy combines had a removable combine head. Sweet! I attached it to a popsicle stick and it totally fit! I was then able to push that popsicle stick under the front of the combine to look attached to the actual cake. Needless to say I was pretty pleased with myself. I think the hardest part of was locating candy corn but my husband was able to find a bag for me. My son so so happy when we filled the hopper with the candy corn. He really thought it completed the cake. 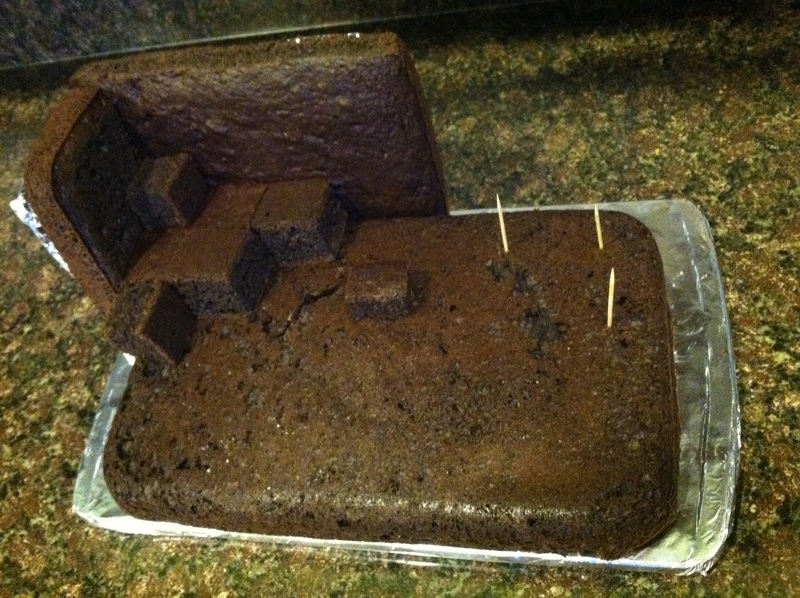 I used the rest of the cake pieces to make a square cake which worked great as a ‘tractor in the field’ kinda cake. I decided to make it look like the farmer was planting although I know plants aren’t instantly visible it was necessary for a 4 year old. I used a small toy tractor and frosting for this cake. Nothing too fancy. 😉 I made the lines on the cake with a frosting comb and used a small star tip for the ‘plants.’ Done! We ate the ‘field cake’ at our small family celebration on his actual birthday and ate the ‘big combine cake’ at his birthday party a couple days later. He liked them both and was thrilled with turning 4. 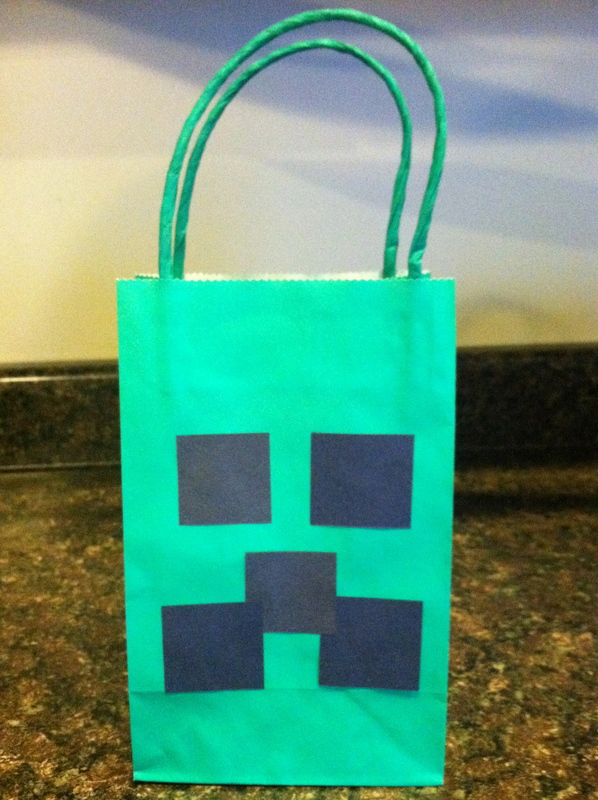 My 10 year old and well frankly my 8 year old and almost 6 year old are all obsessed with everything Minecraft. 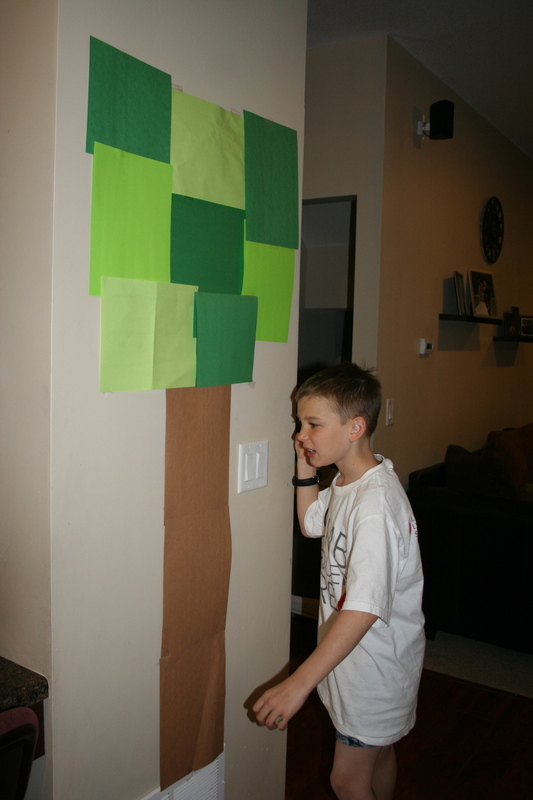 As I read in another Dad’s blog, unless you’ve been under a rock-Minecraft is all the rage with 8-12 year old boys. 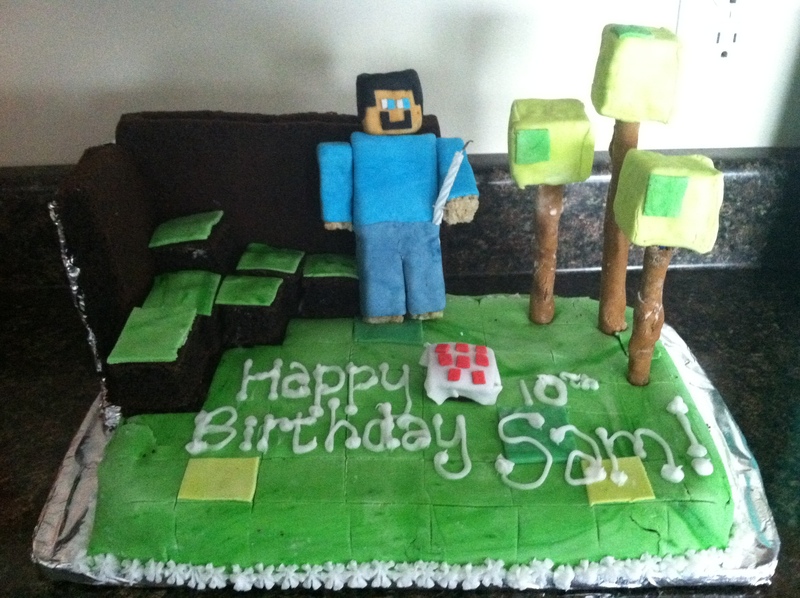 We’ll my 10 year old recently had a birthday and in fact it was his golden birthday so he decided it needed to be extra special but the word he used was, “Epic.” Under a bit of pressure I checked out many blogs and photos of Minecraft cakes and birthday parties. Here is what I came up with under the direction of my kids because honestly am pretty clueless about this Minecraft business. 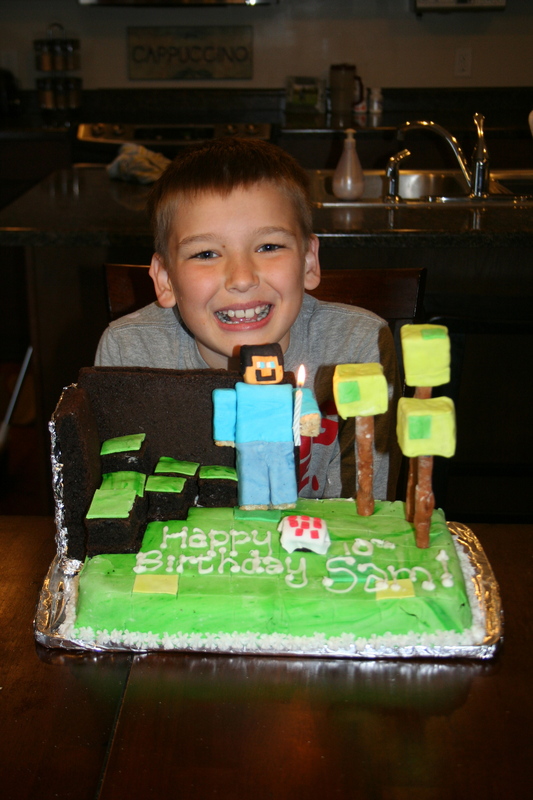 Minecraft Cake: We used 2 cake mixes and experimented with cereal treats. We ended up making the trees out of straws, cereal treats and fondant. 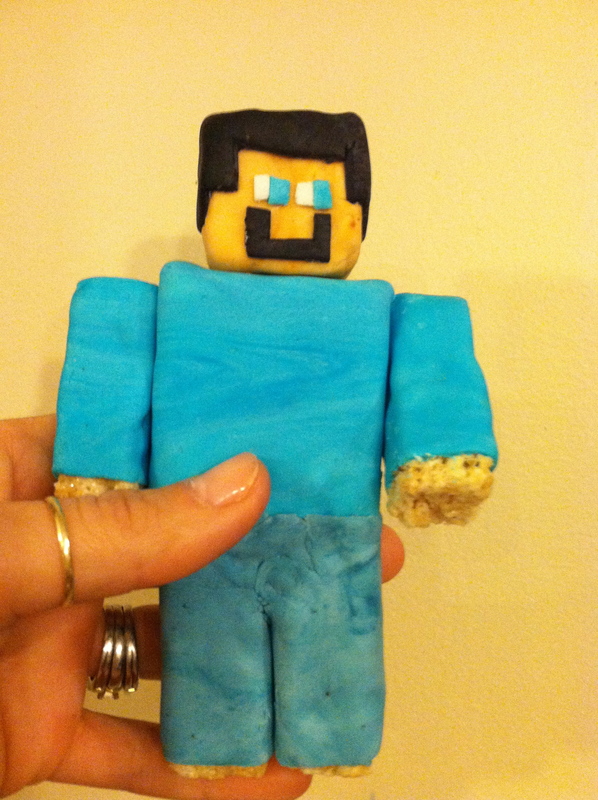 Steve is made of cereal treats and fondant. (I made the fondant myself with a easy marshmallow recipe) In order to make it authentic we had to add a ‘torch’ so the candle was stuck to Steve’s hand with a tooth pick. 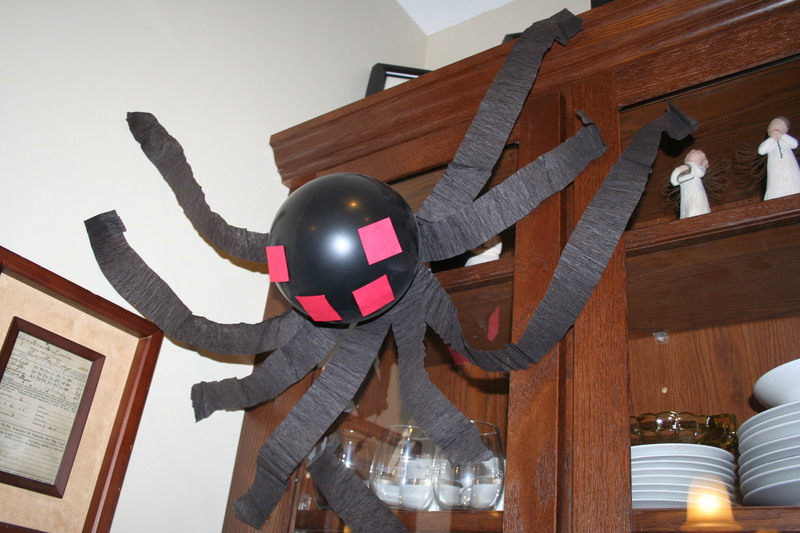 After checking out many blogs I decided to use balloons, construction paper and crepe paper to make spiders. I think this is a birch tree?? Lots of paper taped up to make one for them to chop down I guess. Another idea from the blogger cited above. The kids made their own axe’s from cardboard, crepe paper and tinfoil. They seemed to like it but not as much as playing the actual game. It was a real gamers kinda’ party and they all had fun.